This page has books of saxophone music which may be mixed collections or the music of a single composer. This music is in order by title. / S1125: 6 Great Pieces for Saxophone in E-flat and Piano compiled and edited by Frans Hanssen. Digital Music Print, 2006, SS, 30 + 12 pages. While this book was probably intended for alto saxophone several of the pieces would be suitable for baritone sax. Six original pieces by six composers at the intermediate and upper intermediate level. Contains: Claudy Frédéric La Complainte d'Arlequin (Giocoso), Freddy Van Laer Air for Katrien (Allegretto/Andantino), Erwin Scheltjens Deep Blue Ocean (Andante/Allegro), Remi Guns Tribute to Gerry Mulligan, Ernest Maes Ballad (Adagio), and Steven Mintjens Four Plus Five (Andante/Allegretto Giocoso). Four Plus Five includes mixed meter. Click on the cover image to view a sample page. S1127: 6 Easy Pieces for Saxophone in B-flat and Piano compiled and edited by Frans Hanssen. Digital Music Print, 2006, SS, 26 + 8 pages. Six original pieces by five composers at the easy to intermediate level. Includes: Frans Hanssen Sicilienne, Georg Friedrich Handel Largo, Erwin Scheltjens Szabadon (Lento lamentoso/Allegro), Kris Daelemans Source de l'Ain (Andantino), and Ernest Maes Song (Adagio/Animato poco) and Ariette. Click on the cover image to view a sample page. / S1126: 7 Easy Pieces for Saxophone in E-flat and Piano compiled and edited by Frans Hanssen. Digital Music Print, 2006, SS, 23 + 8 pages. Several of these would be suitable for baritone sax. Seven original pieces by six composers at the easy to intermediate level. Includes: Frans Hanssen Sicilienne, Martin Slootmaekers Sad Waltzes (3), Hector De Jonghe Play Easy Pop (Slowly), Erwin Scheltjens Szabadon (Lento lamentoso/Allegro) and Blue Moon (Larghetto), Ernest Maes Ariette, and Willy Van Dorsselaer Sax Boy (Bien rythmé). Click on the cover image to view a sample page. S1274: 10 Pieces for Soprano Saxophone and Piano by Michael Nyman. Chester Music, 2017, SS, 44 + 20 pages. The long-awaited collection of familiar Michael Nyman melodic creations in intermediate level arrangements by the composer for soprano saxophone and piano. Includes: “If” from The Diary of Anne Frank, “Debbie” from Wonderland, “Taking It as Read”, “Here to There” from The Piano, “The Mistress” from The Libertine, “Tango” from Never Forever, “Franklyn” from Wonderland, “In C Interlude,” “Witness 1,” “The Fort, the Port and the Point” from On Landguard Point. S877: 14 Advanced Christmas Favorites Alto Saxophone arranged by Sean O'Laughlin. Carl Fischer, 2012, SS, 28 pages, plus mp3 CD. This book has more than just the melody of each Christmas carol. While each tune includes the melody it also has a more elaborate arrangement suitable for intermediate and more advance players. The mp3 CD includes orchestral accompaniment for these pieces. 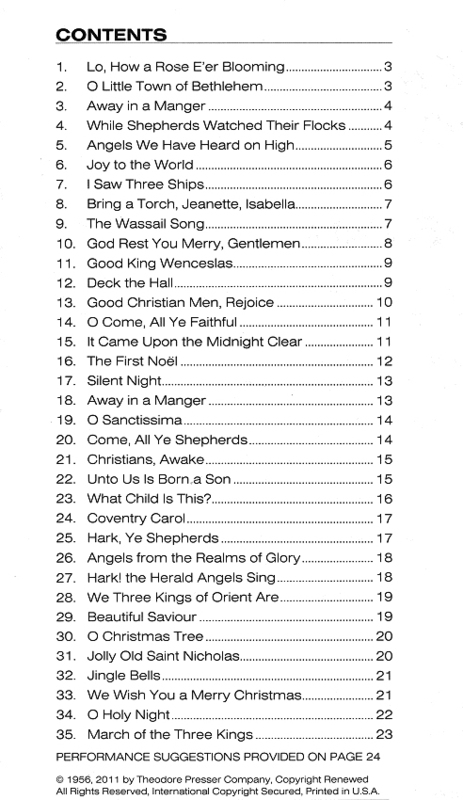 Includes: Angels We Have Heard on High, Away in a Manger, Deck the Halls, The First Noel, Greensleeves, Hark! The Herald Angels Sing, I Saw Three Ships, It Came Upon a Midnight Clear, Joy to the World, O Come All Ye Faithful (Adeste Fideles), O Little Town of Bethlehem, Patapan, Silent Night, and We Three Kings. S740: 20 Tunes in Basic Styles for Saxophone by Valentin Hude. 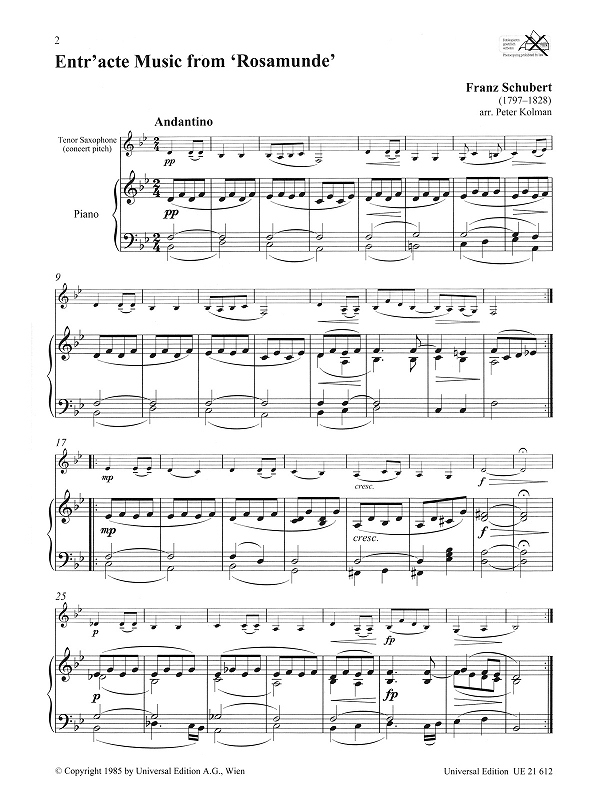 Advance Music, 2011, SS, 32 pages. An interesting collection of tunes and a wide variety of styles. 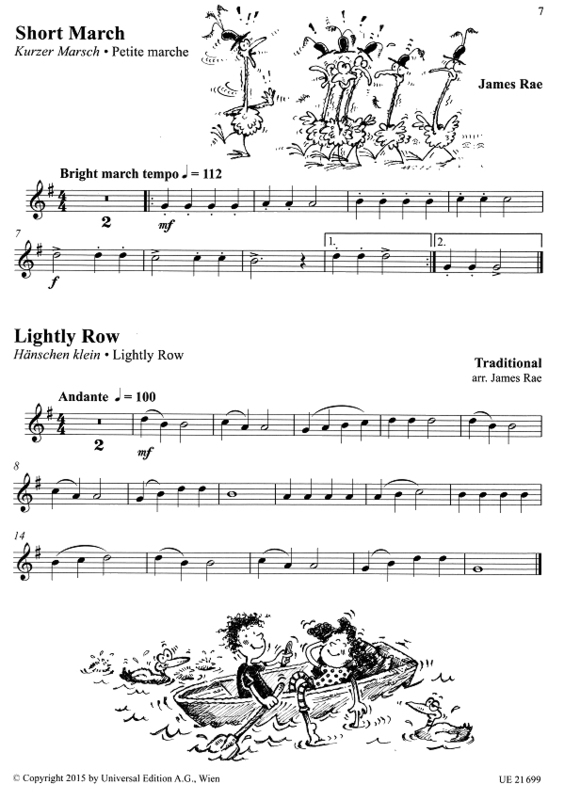 They probably rate as (US) grades 3 and 4 and would also be good for sight reading. Click on the cover image for the Table of Contents and a typical piece. S567: 30 Melodious Duets for Saxophone arranged by Carl Strommen. Kendor Music, 2009, 53 pages, score format. A new and inexpensive collection of duets for two equal saxophones based on arrangements of works by Bach, Beethoven, Mozart, Hook, Tchaikovsky, Telemann, Correlli and others along with 9 original duets by Strommen. Generally at the early intermediate level with a few that are a bit more difficult. S878: After Hours Alto Saxophone and Piano by Pam Wedgwood. Faber Music, 2004, SS, 22 + 8 pages + CD. This book has 8 original tunes by Wedgwood. Contents: Call It a Day (Slow blues), Sliding Doors (With a strong rhythmic feel), The Friends (Peacefully), Remember When (Relaxed, dinner-jazz style), Summer Nights (Tranquillo), Come Dance with Me (Slow and courtly/Fast boogie woogie), Falling (Gently), and Survivor (Swing Tempo). High school level. The CD has backing tracks and a full performance (which probably isn't with saxophone). S477: Alto Saxophone Contest & Festival Performace Solos with Piano Accompaniment arranged by Larry Teal, Sigurd M. Rascher, and Daniel Dorff. Presser, 2009, SS, 45 + 17 pages + CD of piano accompaniment. This is a new publication of easy (E) and intermediate (I) solos from the Presser archives, most arranged by Teal. They are: Johann Sebastian Bach Gavotte (I), Muzio Clementi Presto from Sonatina Op. 37 No. 1 (I), Gabriel Faure Elegie Op. 24 (E), Frederic Chopin Mazurka Op. 67 No. 2 (E), Cesar Cui Berceuse Op. 20 No. 8 (I), George Frideric Hande Bourree from Organ Concerto No. 7 (I), Michel Blavet Adagio and Gigue from Sonata No. 3 (I), Edward German Valse Melancolique from the Suite Lonely Life (E), Johann Pachelbel Canon (E), Jean Marie LeClair Aria from Sonata No. 7 (E), Henri Eccles Sonata, and Joseph Haydn Andante from Sonata No. 1 (I). S522: Alto Saxophone Solos with Piano Accompaniment Easy Level. Rubank, SS, 29 + 13 pages. Ten easy alto saxophone solos, mostly arrangements. Anton Dvorak Air Gracile, Richard Strauss Allerseelen Op. 10 No. 8, Peter I. Tchaikovsky Danse Arabe (from the Nutcracker) and the theme from the Piano Concerto in B-flat minor, Alexander Gretchanioff At the Hearth from Suite Miniature and Evening Waltz, Frank D. Cofield Chartreuse, Leonard Gautier Le Secret (Intermezzo), Clarence E. Hurrell arr. Meadowland, and W.A. 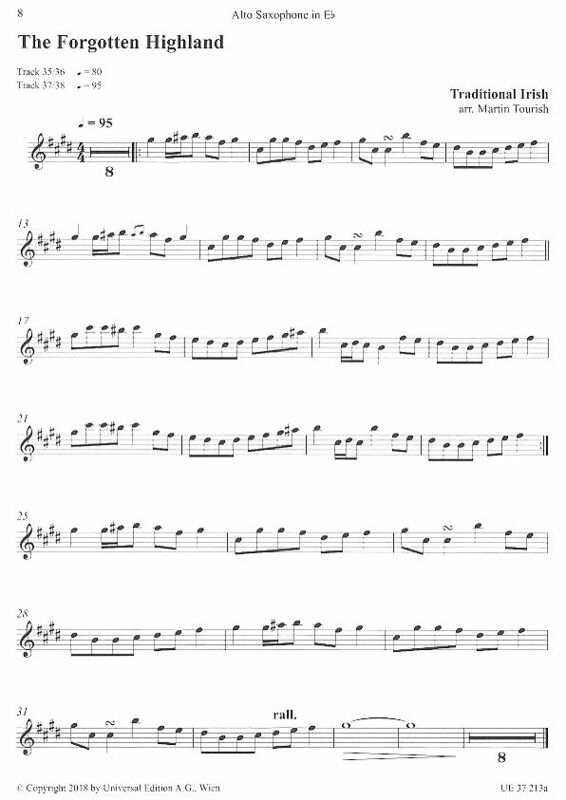 Mozart Minuet (from Haffner Music K250). S521: Alto Saxophone Solos with Piano Accompaniment Intermediate Level. Rubank, SS, 55 + 22 pages. Jules Demersseman Allegretto Brillante, Andre Chailleux Andante and Allegro, Jean Gabriel-Marie Badine (Scherzo), Alfredo D'Ambrosio Canzonetta, Henry W. Davis Carnival of Venice (Air Varie), Richard H. Rehl The Duchess, J. Ed Barat Elegie, Gene Paul Estilian Caprice, Johannes Brahms Hungarian Dance No. 5, Alexander Borodin Polovetsian Dances, and George Bizet Solo de L'Arlesienne. These solos are at the intermediate and upper intermediate level. S064: Amazing Studies Saxophone by Howard Harrison. Boosey & Hawkes, 1997, SS, 62 pages. Howard Harrison has collected and arranged 76 pieces for unaccompanied saxophone. They include material drawn from both classical and folk music, with many dances included. Each piece was selected to develop a specific aspect of technique. There is an index to help you find the right study for each technical problem. This book is at the intermediate level. Click on the book to see the full table of contents. / S1112: Bach for Saxophone arranged by Raaf Hekkema. Schott, 2014, SS, 33 pages. For soprano or alto saxophone solo. Three partitas BWV 1002, BWV 1004, and BWV 1006 which were originally for solo violin. These are advanced works. Click on the cover image to view the first page. S005: Bach for the Saxophone transcribed and edited by Ronald L. Caravan. Ethos Publications. 1998. SS, 68 pages. 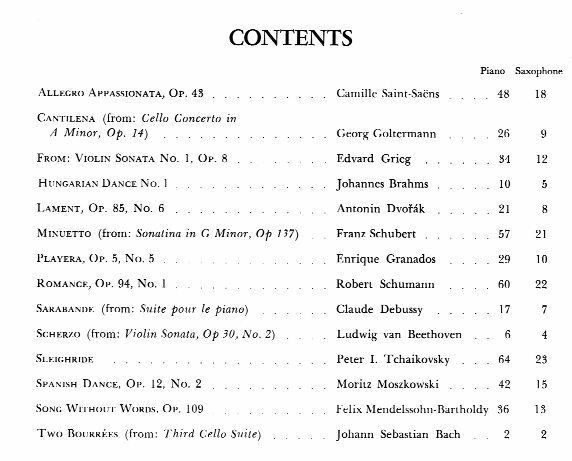 The book contains selected movements from unaccompanied sonatas, partitas, and suites by J.S. Bach. The works were originally written for violin, cello, or flute. This material has been adapted for saxophone because of its extraordinary potential value for developing phrasing, a sense of style, and overall musicianship. The editor has included an explanation of how these pieces were adapted for a wind instrument. WW010: Johann Sebastian Bach - Six Unaccompanied Suites for Cello transcribed by Julie Ann Giacobassi. Fish Creek Music, SS, 60 pages. 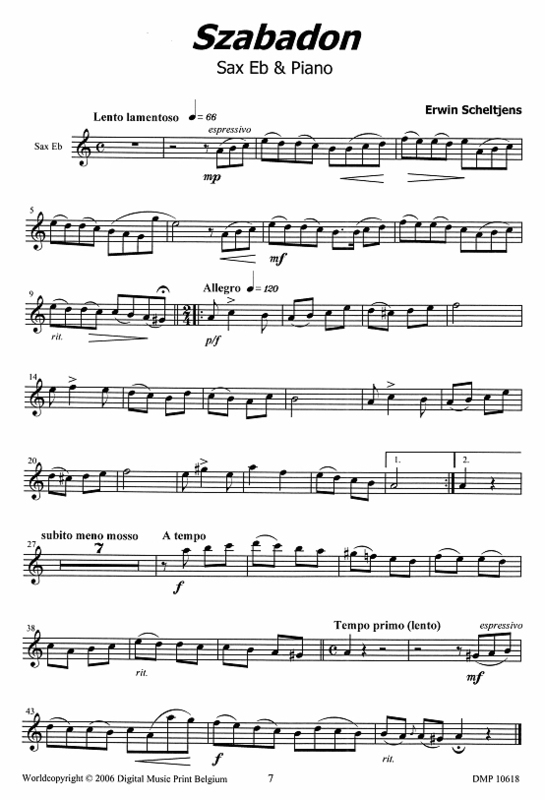 While this music was original transcribed for English Horn by Julie Ann Giacobassi, the English Horn player in the San Francisco Symphony, it is also suitable for oboe, clarinet and saxophone. Julie reports that saxophonists Dave Henderson and Kevin Stewart of the San Francisco Saxophone Quartet are using it and that she has also had good response from Don Sinta about it. S1030: J.S. Bach Six Cello Suites for Saxophone transcribed and edited by Larry Clark. Carl Fischer, 2014, SS 46 pages. The keys and octaves have been adjusted to work on the saxophone. There are occasional altissimo notes (G and A) with alternatives given. The stops are rendered as they were originally with adjustment of the octave in some cases. S073: Baroque Music for Saxophone arranged by J. Michael Leonard. Mel Bay, 2000, SS, 40 + 20 pages. For alto saxophone and piano. Selections include pieces by Handel, Telemann, J. S. Bach, Corelli, Pergolesi, Rameau, Evaristo Dall'abaco, Johann Ernst Galliard and others, for a total of 11 pieces. Intermediate level. S1227: The Best of The Beatles for Alto Sax. Sony/ATV Music Publishing, SS, 96 pages. This second edition features 92 of the greatest songs from the legends of Liverpool, including: All You Need Is Love; And I Love Her; Eleanor Rigby; Got to Get You Into My Life; A Hard Day's Night; Here, There, and Everywhere; Let It Be; Norwegian Wood; Something; Ticket to Ride; Yellow Submarine; and many more. Keys from 1 flat to 3 sharps. Click on the cover image to view the entire list of songs. S1128: The Best of Willy Van Dorsselaer for Sax in B-flat and Piano by Willy Van Dorsselaer compiled and arranged by Frans Hanssen. Digital Music Print, 2006, SS, 20 + 9 pages. Eight original compositions for the intermediate (2-3 year) student. Seven of the compositions are fairly easy while the last piece (Dixieland Story) is more difficult. Click on the cover image to view a sample page. S1043: The Best of Willy Van Dorsselaer for Sax in E-flat and Piano by Willy Van Dorsselaer compiled and arranged by Frans Hanssen. Digital Music Print, 2006, SS, 20 + 9 pages. Eight original compositions for the intermediate (2-3 year) student. Seven of the compositions are fairly easy while the last piece (Dixieland Story) is more difficult. S702: Blues for Two by Claus Henry Koch. Advance Music, 2010, SS, 32 pages. Subtitled: "16 easy duets for saxophone or other instruments in the same key." These are original blues duets at the intermediate level and in score format. S1235: Celebrating Christmas for Alto Saxophone and Piano arranged by Frank J. Halferty. Kendor Music, 2017, SS, 29 + 14 pages. While this is subtitled 14 Grade 4 Solos, it appears that this significantly overstates the difficulty. I would rate these pieces as grade 3 (US) at most. Includes: Bring A Torch, Jeanette, Isabella; Deck The Halls; Ding Dong Merrily On High; God Rest Ye Merry, Gentlemen; The Holly and the Ivy and The First Noel; Il Est Ne Le Divin Enfant; In the Bleak Midwinter; Jingle Bells; Joy to the World; Ukrainian Bell Carol; Up on the Housetop; We Wish You A Merry Christmas; What Child Is This? ; and O Come, O Come, Emmanuel. 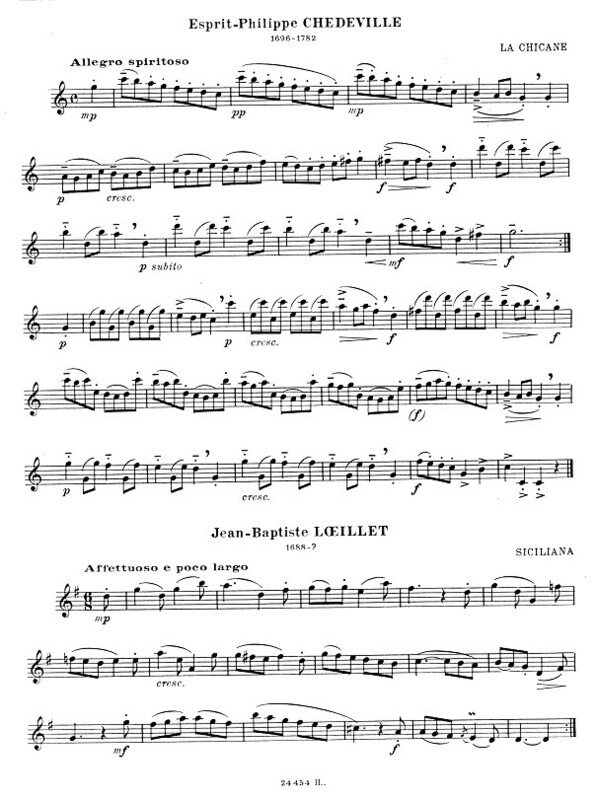 Click on the cover image to view a sample page of the score. / S1294: Celtic Saxophone Play Along arranged by Martin Tourish. Universal Edition, SS, 26 + 8 + 8 pages plus CD. With background notes and performance suggestions, Martin Tourish introduces musicians to the world of Celtic music. The selected pieces span three centures of music-making in Ireland, Scotland, Wales, Cornwall, and Brittany, but comprise only an introduction to this region. The included audio CD features full performances and play-along tracks at various tempi. Click on the cover image to view a sample page. S053: Chamber Music for Three Saxophones (Easy to Medium) by Himie Voxman. Rubank, 1953, SS, 32 pages. 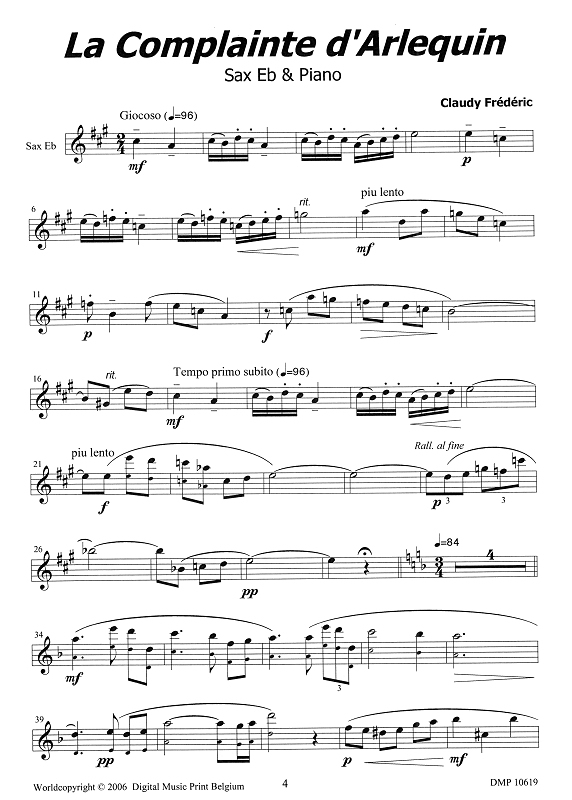 These trios for two alto and one tenor saxophone have been adapted from the works of Mozart, Bach, Telemann, Hydn, Weber, Beethoven, Brahms and others. They are suitable for second and third year students. Published in score form. Click on the cover image to view the Table of Contents. Use your browser's Back button to return. S1150: Child's Play, 18 First Pieces for Young Beginners for Alto Saxophone and Piano composed or arranged by James Rae. Universal Edition, 2015, SS, 18 + 12 pages. The 18 easy pieces are mostly original but include arrangements of several familiar tunes including When the Saint Go Marching In; Lightly Row; Twinkle, Twinkle, Little Star; and Jingle Bells. 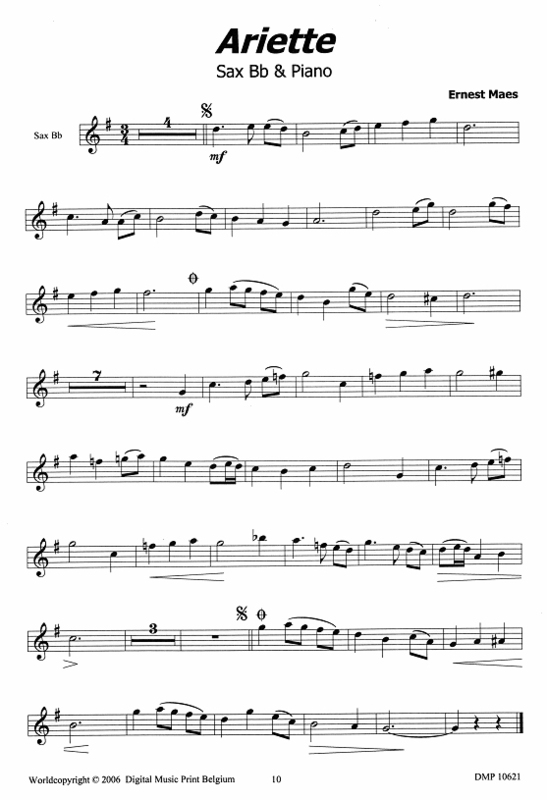 Click on the cover image to view a sample page of the saxophone part. S881: Christmas Lites for Alto Saxophone and Piano, 10 Carols Arranged in a Jazz Style arranged by Lennie Niehaus. Kendor Music, 2012, SS, 35 + 10 pages. Featuring 10 Christmas favorites arranged in jazz styles, the selections in this grade 3-4 collection can be played individually or in combination as a jazz suite. The pieces are: Jingle Bells; We Three Kings; It Came Upon A Midnight Clear; Joy To The World; Silent Night; Away In A Manger; O Come, All Ye Faithful; God Rest Ye Merry, Gentlemen; Good King Wenceslas; and Angels We Have Heard On High. 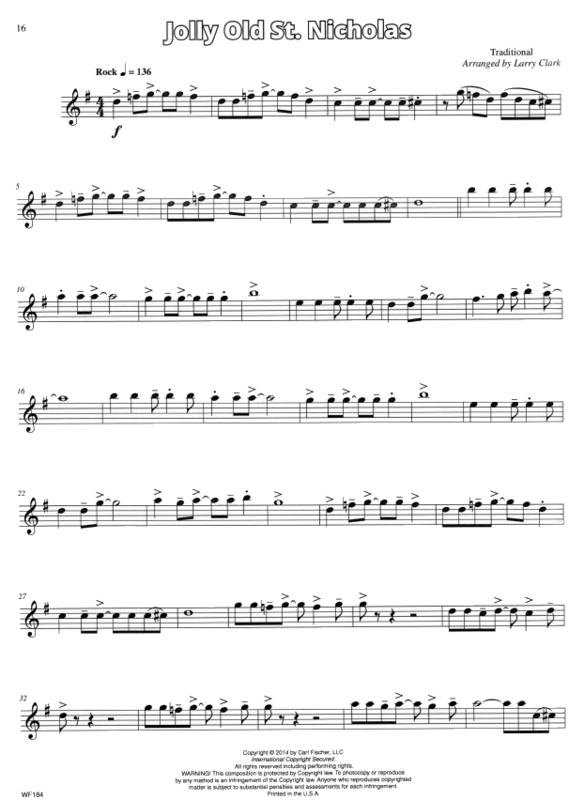 (The clarinet edition can be used for tenor sax.) 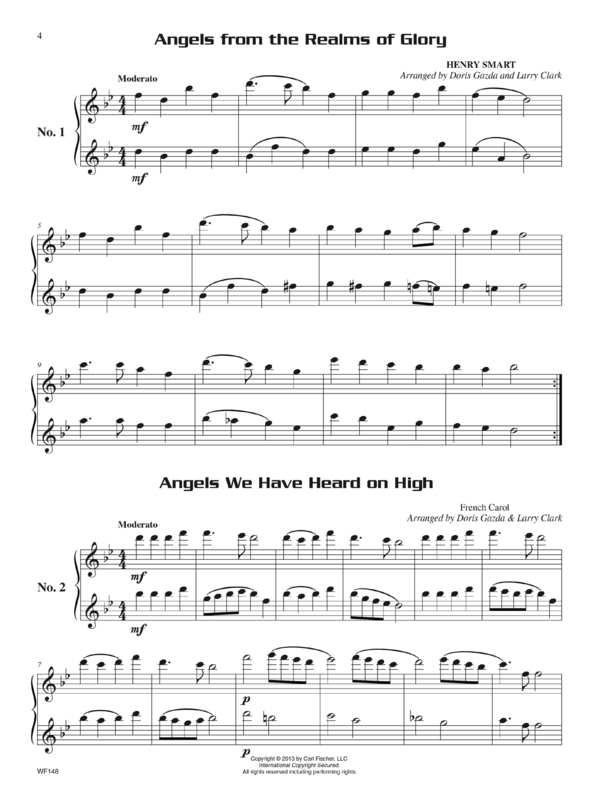 Click on the cover image to view the first two pages of the score of Jingle Bells. / G252: Compatible Christmas Duets for Winds for Alto Saxophone and/or Baritone Saxophone arranged by Doris Gazda and Larry Clark. 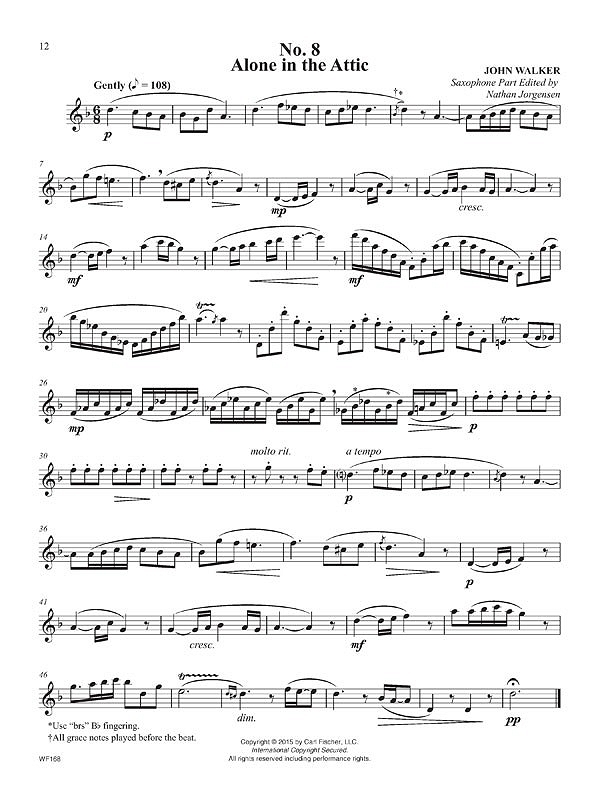 Carl Fischer, 2013, SS, 45 pages in score format. The intention of Compatible Christmas Duets is to provide instrument players the opportunity to play fifty popular Christmas carols in arrangements for two instruments. These duets will work with any combination of any two instruments, so you can play carols with your friends no matter what instrument they play. There are endless possibilities for using duet combinations for fun and entertainment around the holidays. You can play for family, friends, or in a concert setting. We have editions for instruments in C, B-flat, E-flat, and bass clef and can order the versions for Horn in F and Tuba if requested. 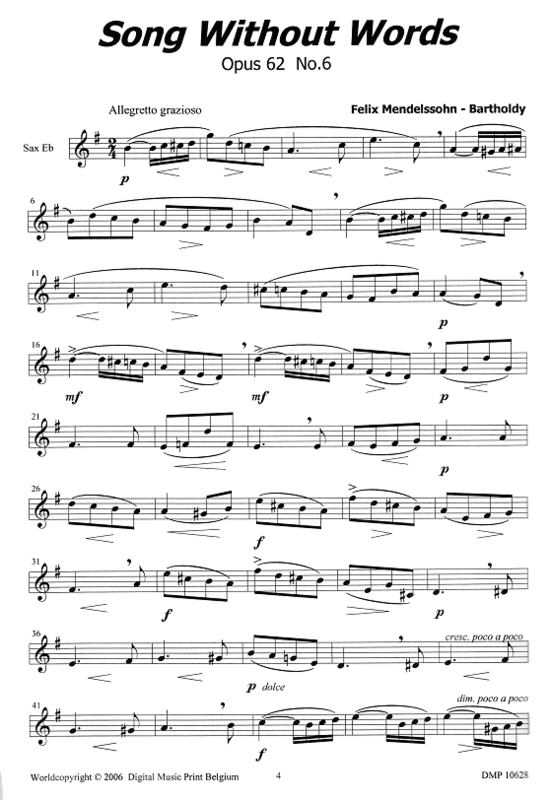 Click on the cover image to view a sample page from the Flute/Oboe book. / S1173: Compatible Trios for Weddings for Alto or Baritone Saxophone in E-flat arranged by Doris Gazda and Larry Clark. Carl Fischer, 2016, SS, 46 pages in score format. This unique collection contains trio settings of popular music for wedding ceremonies that can be played by any combination of three instruments--wind, brass, or strings. Included are classic songs for pre-ceremony, processional, recessional, and post-ceremony, such as Air on the G-String, Amazing Grace, Ave Maria, Bridal Chorus, Canon in D, Jesu, Joy of Man's Desiring, Trumpet Voluntary, and Wedding March. We have editions for violin/oboe, B-flat, and bass clef and can order the versions for Flute, Horn in F, Tuba and a piano score that contains piano/keyboard parts along with a concert pitch score of the instrumental music. 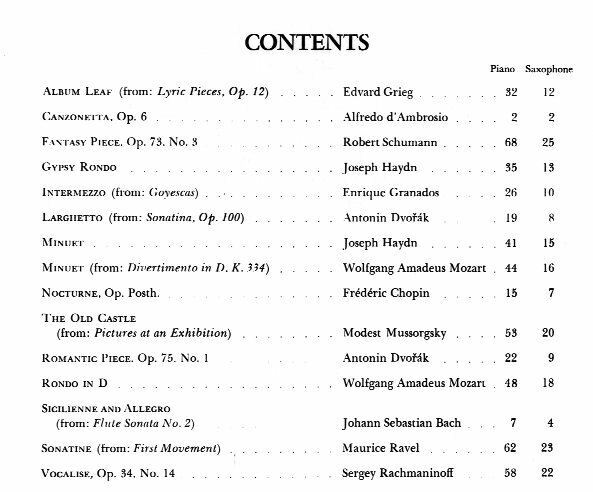 Click on the cover image to view sample pages from the piano score book which includes the trio parts. S054: Concert and Contest Collection for Alto Saxophone Saxophone Part by Himie Voxman. Rubank, 1959, SS, 24 pages. This book contains 14 works for alto saxophone and piano transcribed or edited by Voxman. These solos range in difficulty from several suitable for second year students to those for fourth year (and beyond). Click on the cover image to view the Table of Contents. Use your browser's Back button to return. S055: Concert and Contest Collection for Alto Saxophone Piano Accompaniment by Himie Voxman. Rubank, 1959, SS, 71 pages. Piano accompaniment to S054. PA042: Concert and Contest Collection for Alto Saxophone Performance/Accompaniment CD. Rubank. Performances and piano tracks on CD for S054. Full details here. S243: Concert and Contest Collection for Tenor Saxophone Saxophone Part by Himie Voxman. Rubank, 1972, SS, 24 pages. This book contains 14 works for tenor saxophone and piano transcribed or edited by Voxman. These solos range in difficulty from several suitable for second year students to those for fourth year (and beyond). Click on the cover image to view the Table of Contents. Use your browser's Back button to return. S244: Concert and Contest Collection for Tenor Saxophone Piano Accompaniment by Himie Voxman. Rubank, 1972, SS, 56 pages. Piano accompaniment to S243. PA041: Concert and Contest Collection for Tenor Saxophone Performance/Accompaniment CD. Rubank. Performances and piano tracks on CD for S243. Full details here. S237: Concert Duets for Alto and Tenor Saxophone by Paul Harvey. Roncorp, 1981, SS, 12 pages. Five original duets for alto and tenor saxophone by British performer (clarinet and saxophone), pedagogue, composer, and writer Harvey (1935-). The titles are Roundelay, Two Part Invention, Song Without Words, Lonely Waltz, and Tarantella. They are at the intermediate and upper intermediate level and are presented in score format. S700: Copland for Alto Saxophone (Copland 2000) arranged for alto saxophone by Quincy C. Hilliard. 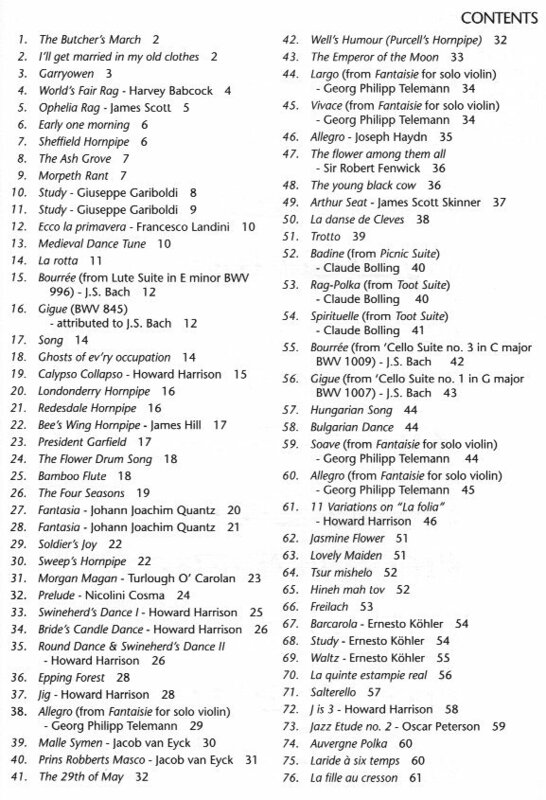 Boosey & Hawkes, 1999, SS, 23 pages (13 of music). Generally at the intermediate level. Contents: Simple Gifts, I've Heard an Organ Talk Sometimes, Vieux Póeme, I Bought Me a Cat, Laurie's Song, Billy and His Sweetheart, Dirge in Woods, Zion's Walls, Ching-a-Ring Chaw, The Little Horses, Going to Heaven!, and Fanfare for the Common Man. G221: Copland Instrumental Album (Copland 2000) piano accompaniment arranged by Quincy C. Hilliard. Boosey & Hawkes, 1999, SS, 52 pages. S1197: A La Découverte de las musique des 17 et 18 siècles Volume 2 for Alto Saxophone and Piano arranged by Jean-Marie Londeix. Editions Henry Lemoine, 1974, SS, 7 + 3 pages. This contains four works from the 17th and 18th centuries. They are: François Duval Rondo, Esprit-Philippe Chedeville La Chicane, Jean-Baptiste Loeillet Siciliana, and Johann-Ernst Galliard Hornpipe. For better intermediate players. 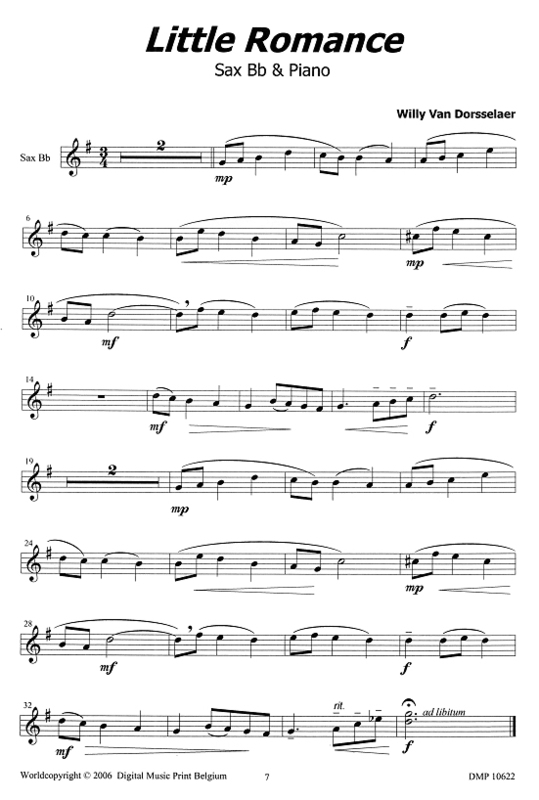 Click on the cover image to view a page from the saxophone part. / S1196: A La Découverte de las musique des 17 et 18 siècles Volume 2 for Soprano or Tenor Saxophone and Piano arranged by Jean-Marie Londeix. Editions Henry Lemoine, 1974, SS, 5 + 3 pages. This contains three works from the 17th and 18th centuries. Esprit-Philippe Chedeville La Chicane, Diogenio Bigaglia Andante, and Johann-Ernst Galliard Hornpipe. For better intermediate players. 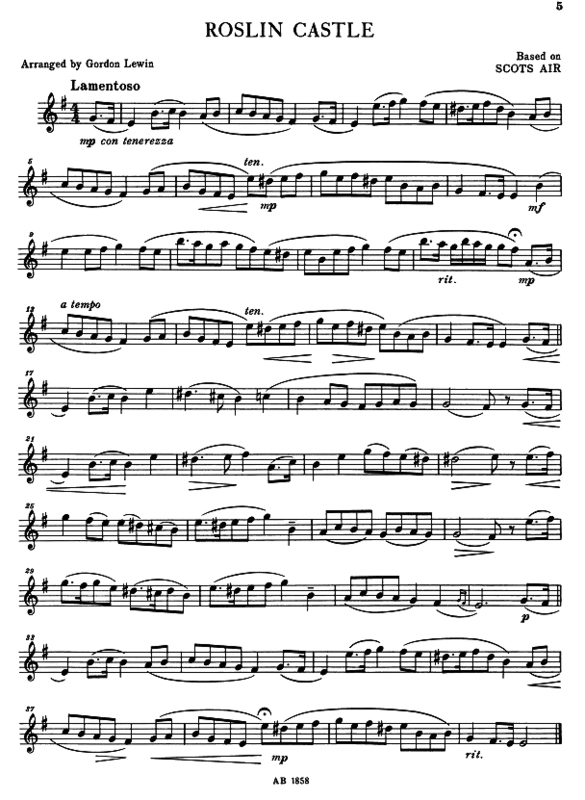 Click on the cover image to view a page from the saxophone part. S384: Duets by Alexander Glazounov transcribed for saxophones by Elaine Zajac. Encore Publications, 2002, SS, 11 pages (score). 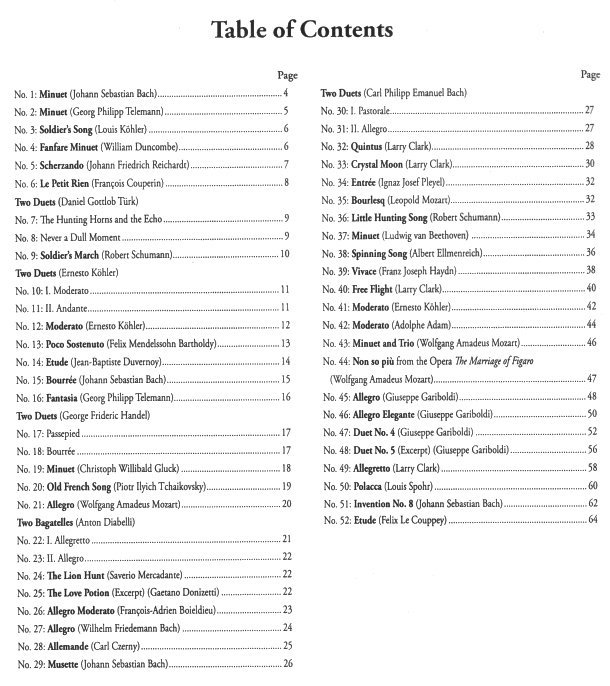 Ten duets by Glazounov that were originally for other woodwind instruments. 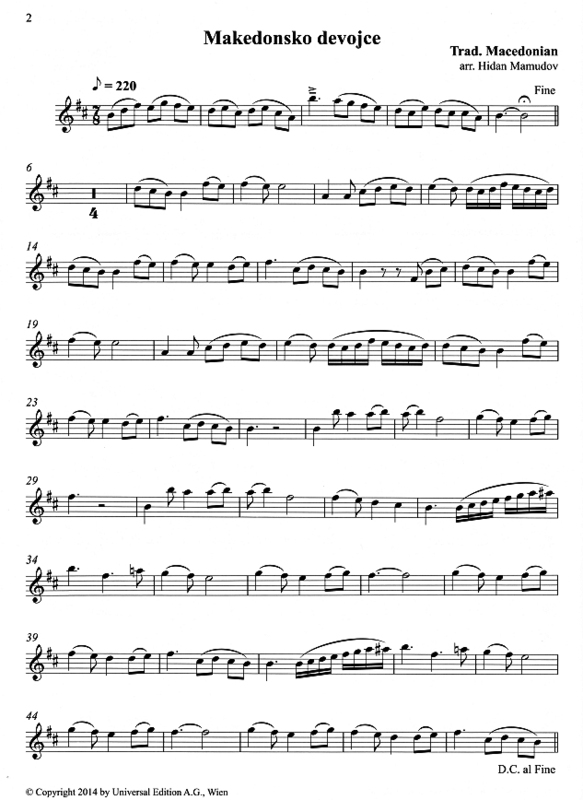 This publication includes a score with both parts in the same key so they can be played by two saxophones of the same type, plus additional second parts so they can be played by a soprano and alto or an alto and tenor. The difficulty ranges from fairly easy (early intermediate) to upper intermediate level. G060: Easy Klezmer Tunes by Stacy Phillips. Mel Bay, PB, 2003, 129 pages + CD. This book is for musicians who are new to klezmer but are reasonably proficient. There are 24 tunes (each with a brief explanation) grouped as Khosid'ls and other slowish tunes; Horas; and Freylakhs, Bulgars, and other up-tempo tunes. The book includes melody parts for C instruments (with parts for flute up an octave), b-flat, e-flat, and bass clef instruments. The included CD has each tune played as written and again with some traditional klezmer embellishments. S807: Eight New Pieces for Alto Saxophone and Piano by John Hopkins. Ricordi, 1988, SS, 16 + 4 pages. Eight short pieces at the early intermediate and intermediate level. Each piece helps develop an aspect of saxophone playing. Click on the cover image to view the first two pieces. / S108: Fifteen Two-Part Inventions by Johann Sebastian Bach adapted for saxophone duet by Larry Teal. Presser, 2003, SS, 35 + 16 pages. Includes parts for two alto saxophones (in score format) and an alternate second part for tenor saxophone. Includes details on how ornaments should be played. Generally upper intermediate level but with a range of difficulty. / S1025: First Album for Young Saxophonists for Alto or Baritone Saxophone and Piano edited by Lasso Czidra and Lajos Darok. EditionDarok, 1991, SS, 30 + 21 pages. This book has 28 pieces, generally from the classical period or earlier but there are some (composed by Farkas for example) that are more recent. An unusual feature of this book is that many of the early pieces have two versions, one the original and another with ornamentation. This means that instead of just being for students in the second or third year of study it can be used longer. Click on the cover image to view an example. 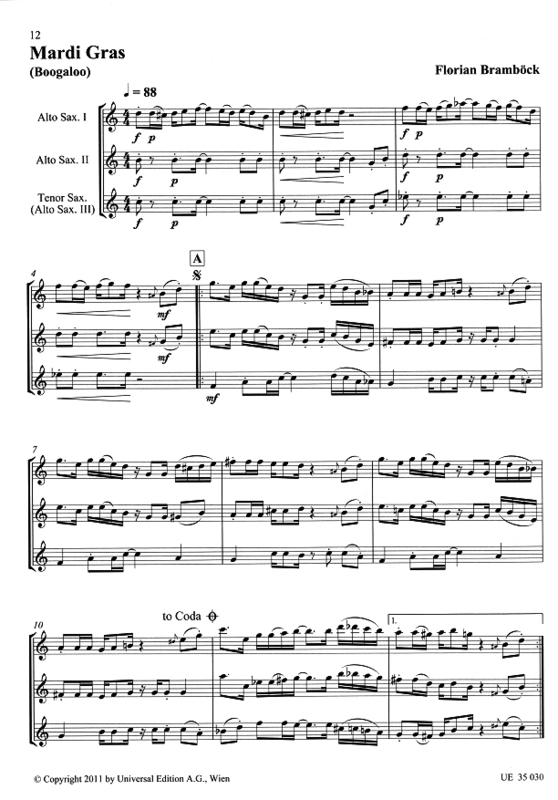 S386: George Frideric Handel Favorite Pieces (Pièces Célèbres) for Alto Saxophone and Piano Book 1 transcribed and adapted by Marcel Mule. Alphonse Leduc, 1996, SS, 24 + 10 pages. 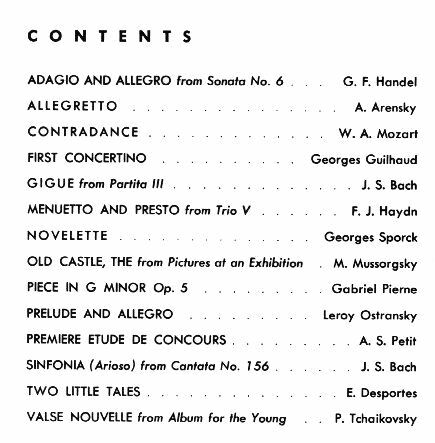 Book 1 contains: Adagio, Larghetto et Final form the 4th Sonate for violin and piano; Allegro from the 3rd Sonate for Flute and Piano; Allegro Largo et Final from the 3rd Sonate for violin and piano; Sicilienne et Gigue from the 5th Sonate for Flute and Piano; plus two short Gavottes and a Largo. Intermediate to upper high school level. S387: George Frideric Handel Favorite Pieces (Pièces Célèbres) for Alto Saxophone and Piano Book 2 transcribed and adapted by Marcel Mule. Alphonse Leduc, 1996, SS, 31 + 13 pages. Book 2 has complete works transcribed for alto saxophone. They are: 1st Sonate for flute and piano, 2nd Sonate for violin and piano, 4th Sonate for violin and piano, and the 6th Sonate for violin and piano. Upper high school to early college level..
S1124: Great Classics for Sax in E-flat & Piano compiled and edited by Frans Hanssen. 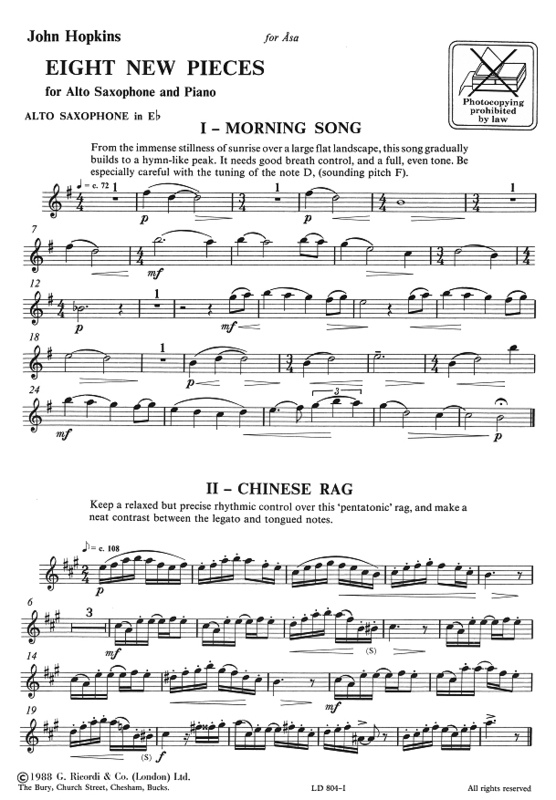 Digital Print Music, 2006, SS, 36 + 15 pages. Includes: Mozart Minuet from Eine Kleine Nachtmusik, Mendelssohn Song Without Words Op. 62 No. 2, Schubert Serenade, Grieg Norwegian Dance Op. 35 No. 2 and Morning Mood from Peer Gynt, Boccherini Minuet, J.S. Bach Badinerie from Suite No. 2 in B minor and Minuet from Anna Magdalen Bach Notebook, Tchaikovsky Andante Cantabile from Quartet in D Op. 11, and Schumann Trumerei. The difficulty level is probably third year for a younger student and second year for an older student. Click on the cover image to view a sample page which is typical of this book. S973: Kendor Master Repertoire B-flat Tenor Saxophone with Piano Accompaniment arranged by Robert Dalpiaz and Jeff Lange, edited by Carl Strommen. 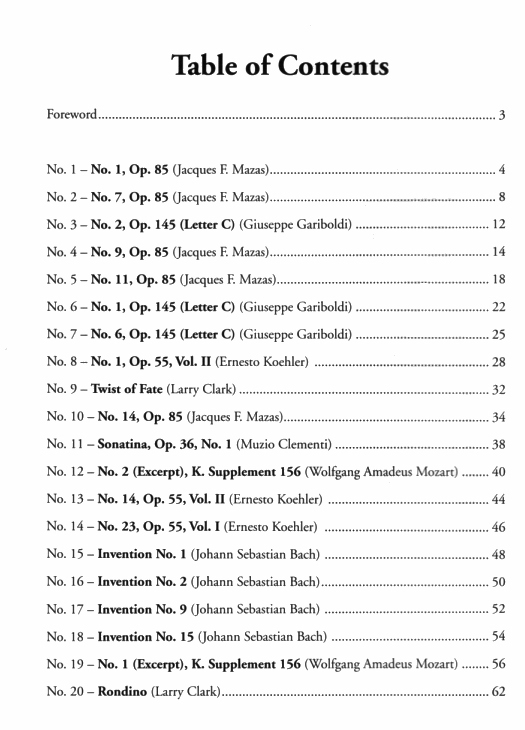 Kendor Music, 2013, SS, 54 + 27 pages. Arranged by saxophonists Robert Dalpiaz & Jeff Lange and edited by pianist Carl Strommen, all eight pieces in this collection have been carefully edited to ensure a great musical experience for grade 4 (early and mid-high school level) saxophonists. Contents: Giuseppe Sammartini Sonata (Op. 13, No. 4), Jean-Baptiste Loeillet Sonata in E minor, W.A. Mozart Concert Rondo (from K. 371) and Concerto No. 3 in E-flat major (from the Horn Concerto #3 K 447), Scott Joplin The Ragtime Dance, George Frederic Handel Allegro and Larghetto (from Sonata #4), Georg Philippi Telemann Fantasia in D minor and Sonata #4. S972: Kendor Master Repertoire E-flat Alto Saxophone with Piano Accompaniment arranged by Robert Dalpiaz and Jeff Lange, edited by Carl Strommen. Kendor Music, 2013, SS, 59 + 24 pages. Arranged by saxophonists Robert Dalpiaz & Jeff Lange and edited by pianist Carl Strommen, all eight pieces in this collection have been carefully edited to ensure a great musical experience for grade 4 (early and mid-high school level) saxophonists. Contents: Jean-Baptiste Breval Sonata, W.A. Mozart Concert Rondo (from K. 371) and Allegro (from the Horn Concerto #1 K 412), Scott Joplin The Ragtime Dance, Giuseppe Sammartini Sonata (Op. 13, No. 4), Georg Philippi Telemann Sonata #1 (from 6 Canonic Sonatas) and Sonata in F Major, and Robert Schumann Allegro (from Adagio And Allegro Op. 70). S1296: Kendor Recital Solos Volume 2 B-flat Tenor Saxophone with Piano Accompaniment and Downloadable MP3 Accompaniment. Almitra/Kendor Music, 2018, SS, 40 + 16 pages. This new collection contains 8 grade 3-4 pieces for instrumental solo with piano accompaniment. Free MP3 downloads of the piano accompaniment are available at kendormusic.com. Many of the titles have been published as single pieces and are listed on several state contest lists. Contents: Gavotte (Lemoine); Intermezzo And Farandole (Bizet); Proclamation (Halferty); Notturno (Hofmann); Greensleeves; Romanze (Hofmann); Maple Leaf Rag (Joplin); and Pavanne (Faure). Click on the cover image to view some sample pages. S1295: Kendor Recital Solos Volume 2 E-flat Alto Saxophone with Piano Accompaniment and Downloadable MP3 Accompaniment. Almitra/Kendor Music, 2018, SS, 50 + 18 pages. This new collection contains 8 grade 3-4 pieces for instrumental solo with piano accompaniment. Free MP3 downloads of the piano accompaniment are available at kendormusic.com. Many of the titles have been published as single pieces and are listed on several state contest lists. 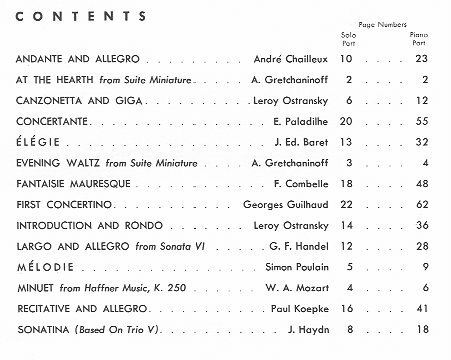 Contents: Mozart Sonatina; Essay In Blue (Edmondson); Harlequinade (Niehaus); Seaside Images (Niehaus); Sonata No. 11 (Haydn); Notturno (Hofmann); Air For Alto (Frackenpohl); and The Entertainer (Joplin). Click on the cover image to view some sample pages. / S951: Klezmer Saxophone Duets written or arranged by Michael Lösch. Universal Edition, 2012, SS, 40 + 25 pages. Includes parts for two alto saxophones (in score format) and an alternate second part for tenor saxophone. Michael Lösch has selected nine pieces from the enormous Klezmer repertoire (Tish Nigun, Oi Tate, Oyfn Veg Shteyt a Boym, Der Heyser Bulgar, Klezmeron, L'Chaim, Mazel Tov, and Lebedik) and has also included four of his own compositions inspired by the genre. Generally upper intermediate level but with a range of difficulty. Ob037: The Oboist's Concert Album compiled and revised by Albert J. Andraud. Southern Music Co., 1940, SS & SB, 72 + 223 pages. A collection of 33 original oboe solos with piano accompaniment for concerts and contests also suitable for saxophone. Includes works by Bach, Colin, Leclair, Handel, Mozart, and more. Click on the cover image to view the Table of Contents. Use your browser's Back button to return. / S580: Paganini for Saxophone (24 Capricci Op. 1) arranged by Raaf Hekkema. Schott, 2009, SS, 61 pages. These are very challenging arrangements for soprano or alto saxophone of Paganini's 24 Caprices Op. 1. Perfect for the advanced student, they feature high altissimo and a few multiphonics. A preface gives an explanation of Dutch saxophonist Hekkema's process of developing these arrangements. There are also short notes on each piece. S844: Pièces Célèbres for Alto Saxophone and Piano Book 2 transcribed and adapted by Marcel Mule. Alphonse Leduc, SS, 24 + 10 pages. This book contains pieces by 9 composers that were originally published individually by Leduc as part of their Classiques du Saxophone series. They are: Mendelssohn Chanson de Printemps, Gluck Orphée (Scène des Champs-Élysées), Monsigny Le reine de Golconde (Gavotte), Tartini Grave, Mozart Ballet des petits riens (Gavotte sentimentale), Beethoven Petite valse, Weber Petite valse et tryrolienne, Schubert Sérénade, and Schumann Scènes d'enfants (Rêverie). Middle and upper intermediate level. S483: Pièces Célèbres for Alto Saxophone and Piano Book 3 transcribed and adapted by Marcel Mule. Alphonse Leduc, SS, 27 + 11 pages. This book has transcriptions from 10 different composers. They are: J.S. Bach Suite d'orchestre en ut - Bourrée - BWV 1066, Campra Achille et Déidamie - Gavottes des bergers, Destouches Issé - Pastorale et Passepied, Handel Gavottes - Scilienne et Gigue (from the Fifth Sonate for Flute), LeClair Adagio (from the Third Sonate for Violin), Lully Air tendre et courante, Martini Romance sans parole (No. 20), Mondonville Tambourin, and Rameau Let Temple de la Gloire - Gavotte. Middle and upper intermediate level. S482: Pièces Célèbres for Soprano Saxophone and Piano transcribed and adapted by Marcel Mule and Jean-Marie Londeix. Alphonse Leduc, SS, 28 + 11 pages. This book contains 10 transcriptions for soprano saxophone: J.S. Bach Scherzetto (BWV Anh 114), Boccherini Adagio, Couperin Berceuse en Rondeau, Gluck Gavotte, J.M. LeClair Musette, Handel Sonate No. 1, Lully Ballets du Roi - Sarabande et Gavotte, Rameau Tambourin, Philidor Chat d'eglise - Ego dis amicum, and Schubert Suite de Valses. Middle and upper intermediate level. S676: Progressive Duets Volume 1: Easy to Medium for Alto Saxophone in E-flat arranged or composed by Larry Clark. Carl Fischer, 2006, SS, 64 pages. This book contains 52 duets from the beginner to the intermediate level (with more of these than the easy duets). They could be used for any pair of equal saxophones. Composers include JS Bach, CPE Bach, Telemann, Tchaikovsky, Mozart, Haydn, Spohr and many more. Click on the cover image to view the Table of Contents. Use your browser's Back button to return. S707: Progressive Duets Volume 2: Medium to Advanced for Alto Saxophone in E-flat arranged or composed by Larry Clark. Carl Fischer, 2011, SS, 64 pages. This book contains 20 duets from the intermediate level to the advanced intermediate level. They could be used for any pair of equal saxophones. There is some overlap with Volume 1 as the easier duets in this book are less difficult than the most advanced in the earlier volume. In addition to two duets by Clark, composers include JS Bach, Mazas, Gariboldi, Koehler, Clementi, and Mozart. Click on the cover image to view the Table of Contents. Use your browser's Back button to return. S268: The Rascher Collection for Alto Saxophone and Piano arranged by Sigurd Rascher. Chappell, SS, 33 + 14 pages. Seven solos from the repertoire of Sigurg Rascher which range from intermediate to advanced level pieces. Contents: Glaser-Rascher: Carnival of Venice, Padre Martin Gavotte, G.F. Handel Sonata No. 3 (Adagio/Allegro/Largo/Allegro), J.S. Bach Prelude to Cantata No. 12 (Weinen, Klagen, Sorgen Zagen) and Prelude to Cantata No. 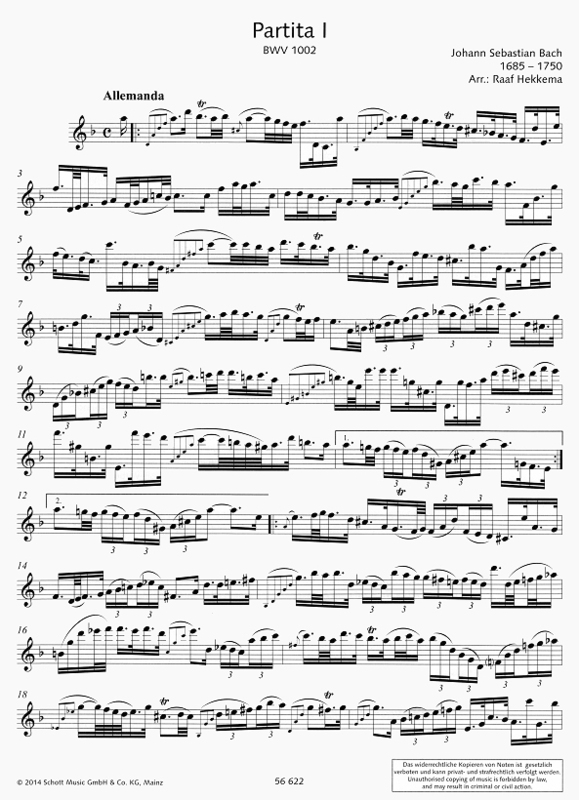 156 (Ich Steh' Mit Einem Fuss Im Grabe), Jean Philippe Rameau Rigaudon, and Glaser-Rascher Variations on a Gavotte by Corelli. S655: Repertoire Classics for Alto Saxophone, 38 Repertoire Pieces with Piano Accompaniment compiled and edited by Lee Patrick. 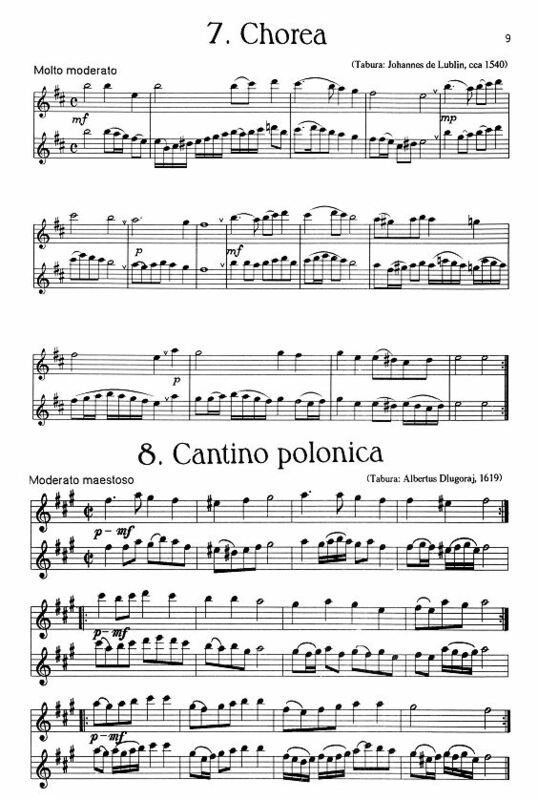 Carl Fischer, 2010, SS, 48 pages + CD with piano accompaniments as MP3 audio files (playable on a computer or player for MP3 files) and printable PDF files. A collection of some familiar and some less well known pieces at US grades 2 through 4. Isaac Albeniz Tango Op. 165 No. 2; Arne Thomas Allegretto; Johann Sebastian Bach Arioso from Cantata No. 156, BWV 156 (Ich steh' mit einem Fuss im Grabe) and Bist du bei mir (If Thou Be Near) BWV 508; Georges Bizet Entr'acte from Carmen and Minuet from L' Arlesienne; Johannes Brahms Waltz Op. 39 No. 15; Max Bruch Kol Nidrei Op. 47; Frederic Chopin Largo; Arcangelo Corelli Gigue from Sonata Op. 5 No. 5 and Sarabande from Sonata Op. 5 No. 5; Claude Debussy Reverie; Gabriel Faure Berceuse Op. 16 and Sicilienne, from Pelleas et Melisande; Cesar Franck Panis Angelicus; Giuseppe Giordani Aria (Caro mio ben); Christoph Willibald von Gluck Minuet and Dance of the Blessed Spirits from the Opera Orfeo ed Euridice; Joseph Gossec Tambourin; Charles Gounod Meditation on Prelude No. 1 of J.S. Bach; Edvard Greig Solvejg's Song; George Frideric Handel Giga from Sonata Op. 1, No. 1 The Harmonious Blacksmith; Franz Joseph Haydn Serenade from String Quartet No. 8 Hob. III: No. 17; Franz Liszt Liebestraum; Pietro Locatelli Cantabile; Benedetto Marcello Sonata in F major; Felix Mendelssohn On the Wings of Song; Wolfgang Amadeus Mozart Adagio K. 285 and Aria "Dove Sono" from the Opera The Marriage of Figaro; Gioachino Rossini Tarantella; Camille Saint-Saens Pavane and The Swan from Carnival of the Animals; Franz Schubert Ave Maria Op. 52 No. 6 and Serenade; Robert Schumann Traumerei from Scenes from Childhood Op. 15 No. 7; and Peter Ilyich Tchaikovsky Andante and June (Barcarolle) from The Seasons Op. 37 No. 6. S949: Repertoire Explorer Tenor Saxophone and Piano selected by James Rae. Universal Edition, 2012, SS, 39 + 22 pages. Teachers seeking material for their students to enjoy at a defined technical level need look no further. James Rae has carefully selected a variety of pieces from classical to modern, along with studies (by Rae) of all kinds. These books present an opportunity for student players to broaden their musical experiences and explore the wide variety of repertoire available to them. The pieces are grouped by grades (US) 1-3. Click on the cover image to view the Table of Contents. Click here to view the score for the first grade 1 piece. S730: Saxophone Debut, 12 Easy Pieces for Beginners for Alto Saxophone by James Rae. Universal Edition, 2011, SS, 21 pages + CD. All of these pieces for young alto saxophonists in their earliest stages of learning can be performed as a solo or in unison with others. Some have an optional second part and may also serve as ensemble material. While written specifically for the instrument and addressing the challenges beginners would encounter, a special section is included of four pieces which are "key friendly" for beginners on most instruments and are therefore ideal pieces for mixed instrumental groups. These same four pieces will appear in subsequent books for other instruments in the Debut series. S390: Saxophone Solos Vol. 1 for Alto Saxophone and Piano edited by Paul Harvey. Chester Music, 1977, SS, 23 + 7 pages. This book has six solos for alto saxophone with piano accompaniment. The solos range in difficulty from early intermediate to a bit beyond the middle of the intermediate range. They are: Georges Bizet L'Arlesienne (the saxophone solo), Modest Mussorgsky The Old Castle from "Pictures at an Exhibition," Leo Delibes Barcarolle from "Sylvia" (the saxophone solo from Act Three), Zoltan Kodaly The Battle and Defeat of Napoleon from "Hary Janos," Thomas Greaves What is Beauty but a Breath, William Byrd Pavane for the Earl of Salisbury, Dorothy Harvey Lullaby for a Saxophone, and Carey Blyton In Memoriam Scott Fitzgerald. S392: Saxophone Solos Vol. 2 for Alto Saxophone and Piano edited by Paul Harvey. Chester Music, 1977, SS, 25 + 11 pages. This book has eight solos at the mid and upper intermediate level for alto saxophone and piano. They are: Ralph Vaughan Williams Dance of Job's Comforters (the saxophone solo from Job: A Masque for Dancing), Arthur Sullivan "The Sun and I" (from The Mikado), Johann Sebastian Bach Menuet and Bandinerie (from Suite in B minor for flute and strings), George Frederic Handel Allegro (from Seven Pieces for Keyboard), Dorothy Harvey London's Burning, Colin Cowles Tolmers Village (theme music from a TV show), and Paul Harvey Caprice Anglais. S391: Saxophone Solos Vol. 1 for Tenor Saxophone and Piano edited by Paul Harvey. Chester Music, 1979, SS, 24 + 8 pages. This book has eight solos for tenor saxophone with piano accompaniment. These solos are in the intermediate range of difficulty. They are: Welsh Traditional The Red Piper's Melody, Camille Saint Saëns The Swan, George Frederic Handel Allegro from Suite XIV and "Love in Her Eyes Sits Playing," Enrique Granados Andaluza, Dorothy Harvey Christopher's Caper, and Carey Blyton Saxe Blue and Mock Joplin. S393: Saxophone Solos Vol. 2 for Tenor Saxophone and Piano edited by Paul Harvey. Chester Music, 1979, SS, 28 + 11 pages. This book has eight solos at the mid and upper intermediate level (and perhaps a bit beyond) for tenor saxophone and piano. They are: Maurice Ravel Bolero (the famous tenor saxophone solo; the notes are exactly the same for the soprano saxophone solo), Haydn Millars Andante and Rondo (adapted from the bassoon solo), Dorothy Harvey Christopher's Calypso, Colin Cowles Three Sketches from Bala, Paul Harvey Rue Maurice-Berteaux, and Joseph-Hector Fiocco Arioso. / S946: Saxophone Trios from Around the World for 3 Alto Saxophones or 2 Alto Saxophone and Tenor Saxophone arranged or composed by Florian Bramböck. Universal Edition, 2011, SS, includes score and indivdual parts (4). Florian Bramböck has brought together various musical styles and genres from around the world and arranged popular tunes for saxophone trio. Genres covered include: Afro-Latin Jazz, Celtic music, Alpine folk songs and Klezmer. Some songs featured are: “Rio by Night,” “Pata Pata,” “Bei mir bist du schean,” “Danny Boy,” “Mardi Gras” and more. These pieces will suit intermediate-level players and all three parts are well-balanced. 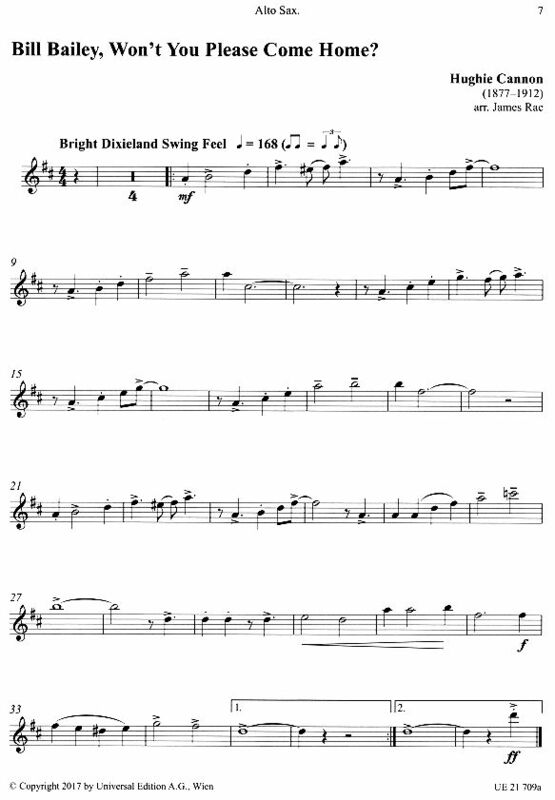 Along with original compositions, the arrangements of popular melodies bring a fresh variety of new tonal and rhythmic elements into play, improving technique and the necessary skills for ensemble playing. There is quite a range of difficulty from a couple of pieces which are very easy to upper intermediate level. Click on the cover image to view a page from one of the more difficult pieces. S041: Selected Duets for Saxophone Vol. 1 Easy-Medium compiled and edited by Himie Voxman. Rubank, 1947, SS. 72 pages. Equal parts. For two like saxophones. This is a useful and popular series. S042: Selected Duets for Saxophone Vol. 2 Advanced compiled and edited by Himie Voxman. Rubank, 1947, SS. 72 pages. Equal parts. For two like saxophones. This is a useful and popular series. S065: Selected Studies for Saxophone by Himie Voxman. Rubank, 1942, SS, 76 pages. Intermediate-advanced level etudes drawn from many composers in all major and minor keys, plus scales, scales in thirds, and arpeggios. S133: Sixty for Sax by Alan Bullard. ABRSM Publishing, 2005, SS, 48 pages. This is a book of 60 unaccompanied saxophone solos, which are progressive in difficulty from beginning to advanced level (ABRSM grades 1-8). With music in many styles, it will provide the student with supplemental material during many years of study. S132: Solos for Alto Saxophone, 41 Repertoire Pieces with Piano Accompaniment compiled and edited by Lee Patrick. Carl Fischer, 2003, PB, 144 + 56 pages. This book covers repertoire from (US) grades two through five. Many of these titles are on state festival lists and all the solos are wonderful for teaching musicianship to players of all ages. Music by Arne, Bach, Bizet, Brahms, Debussy, Franck, Gossec, Haydn, Mozart, Rossini, Telemann, et. al. including such gems as: the Sicilienne from Pelléas et Mélisande (Fauré) and the Tango by Isaac Albeniz. This is an essential repertoire collection for all saxophone teachers and performers. Click on the cover image to view the Table of Contents. Use your browser's Back button to return. S199: Solos for the Alto Saxophone Player with Piano Accompaniment selected and edited by Larry Teal. G. Schirmer, 1965, SS, 75 + 26 pages. Fifteen pieces generally at the intermediate level with a few a little easier. Contents: Album Leaf (Grieg), Canzonetta (D'Ambrosio), Fantasy Piece (Schumann), Gypsy Rondo (Haydn), Intermezzo (Granados), Larghetto (Dvorák), Minuet (Haydn), Nocturne (Chopin), The Old Castle (Mussorgsky), Romantic Piece (Dvorák), Rondo (Mozart), Sicilienne and Allegro (Bach), Sonatine (Ravel), and Vocalise (Rachmaninoff). Click on the cover image to view the Table of Contents. S200: Solos for the Tenor Saxophone Player with Piano Accompaniment selected and edited by Larry Teal. G. Schirmer, 1965, SS, 69 + 24 pages. Fourteen pieces at the intermediate level with a few a little easier. 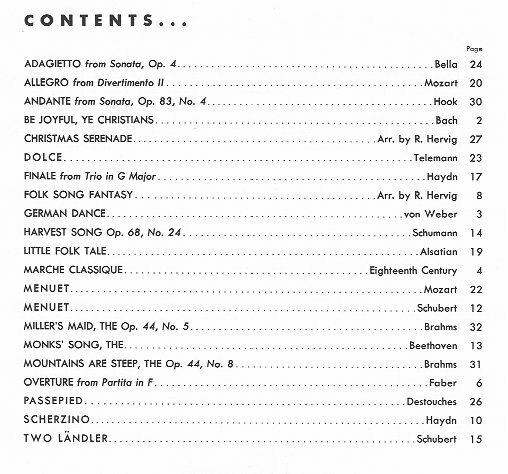 Contents: Allegro Appassionata (Saint-Saëns), Bourree (Bach), Cantilena (Goltermann), Hungarian Dance No. 1 (Brahms), Lament (Dvorák), Minuetto (Schubert), Playera (Granados), Romance (Schumann), Sarabande (Debussy), Scherzo (Beethoven), Sleighride (Tchaikovsky), Song Without Words (Mendelssohn), Spanish Dance (Moszkowski), and Violin Sonata (Grieg). Click on the cover image to view the Table of Contents. 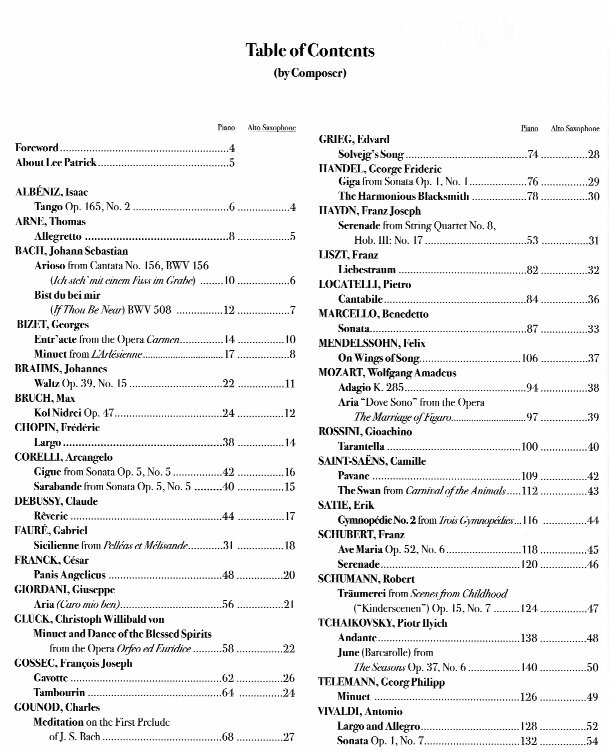 S1075: Twenty-two Unaccompanied Pieces for Saxophone composed and/or edited by Gordon Lewin. ABRSM, 1984, SS, 23 pages. Gordon Lewin (1921-2008) was a British composer, clarinetist, and saxophonist, who studied at the Royal College of Music and performed on more than 100 film scores. This is a collection of pieces combining a popular mix of original pieces (by Lewin) and arrangements. The arrangements include both classical pieces from Bach, Paganini and Rossini etc. and folksongs from Andalucía, Israel and Scotland. 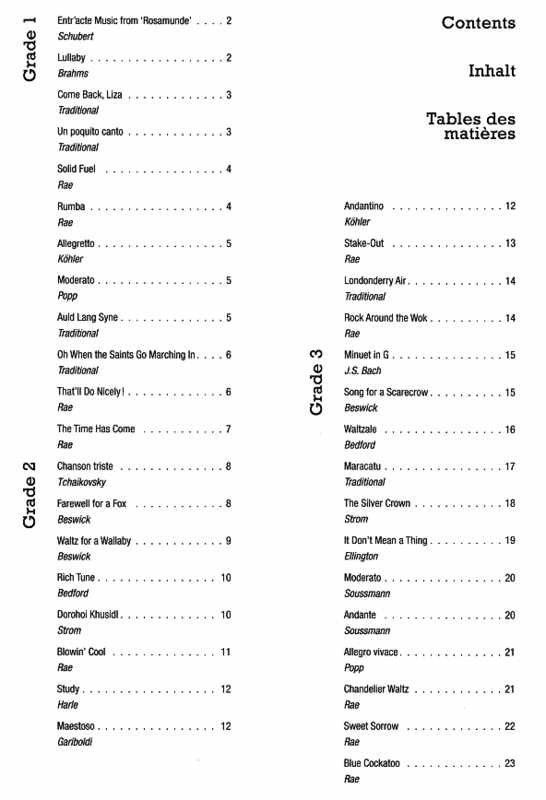 The selections are at the ABRSM grades of 3-6 (on their 8 level scale). Click on the cover image to view a sample page. / S1233: You Must Remember This for Alto or Tenor Saxophone and Piano arranged by James Rae. Universal Edition, 2017, SS 2013, SS, 20 + 10 + 10 pages. Includes individual parts for alto and tenor saxophone. Inject a bit of nostalgia in your advancing student's repertoire. Rae has compiled 10 instantly recognizable songs into an album of saxophone solos to encourage a focus on the melodic line. Includes: Daisy Bell, As Time Goes By, La Paloma (The Dove), Give My Regards to Broadway, Fascination, Bill Bailey, Johnny Comes Marching Home, Over the Waves, Misty and Chicago. Piano accompaniments are accessible for teacher or fellow students, while the solo parts are aimed at elementary to intermediate-level skills (US grade 2-3). 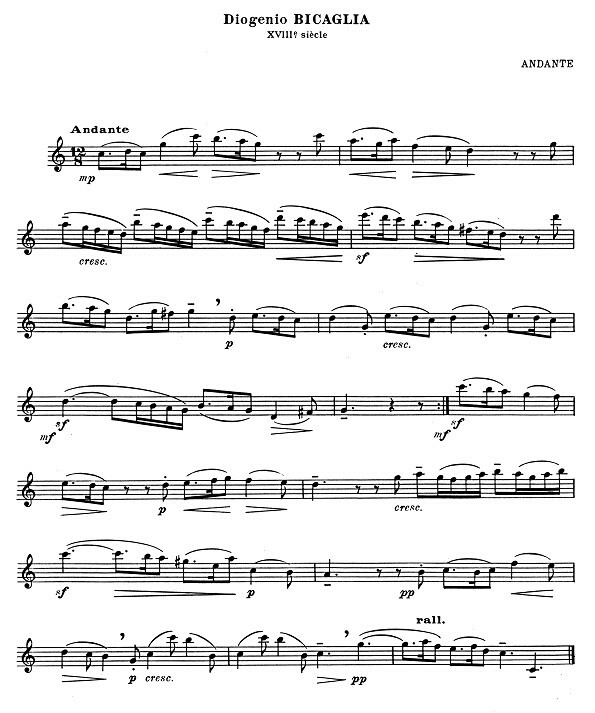 Click on the cover image for a sample alto saxophone page.